YORKTOWN HEIGHTS, NY	- 28 Feb 2012: Scientists at IBM Research (NYSE: IBM)/ (#ibmresearch) have achieved major advances in quantum computing device performance that may accelerate the realization of a practical, full-scale quantum computer. For specific applications, quantum computing, which exploits the underlying quantum mechanical behavior of matter, has the potential to deliver computational power that is unrivaled by any supercomputer today. IBM researchers will be presenting their latest results today at the annual American Physical Society meeting taking place February 27-March 2, 2012 in Boston, Mass. The most basic piece of information that a typical computer understands is a bit. Much like a light that can be switched on or off, a bit can have only one of two values: "1" or "0". For qubits, they can hold a value of “1” or “0” as well as both values at the same time. Described as superposition, this is what allows quantum computers to perform millions of calculations at once. IBM has recently been experimenting with a unique “three dimensional” superconducting qubit (3D qubit), an approach that was initiated at Yale University. Among the results, the IBM team has used a 3D qubit to extend the amount of time that the qubits retain their quantum states up to 100 microseconds – an improvement of 2 to 4 times upon previously reported records. This value reaches just past the minimum threshold to enable effective error correction schemes and suggests that scientists can begin to focus on broader engineering aspects for scalability. A picture of IBM’s “3D” superconducting qubit device where a qubit (about 1mm in length) is suspended in the center of the cavity on a small Sapphire chip. The cavity is formed by closing the two halves, and measurements are done by passing microwave signals to the connectors. 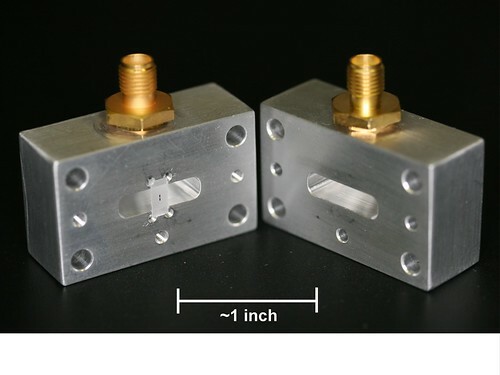 Despite the apparent large feature size (the cavity is about 1.5 inches wide) for this single qubit demonstration, the team believes it is possible to scale such a system to hundreds or thousands of qubits. In separate experiments, the group at IBM also demonstrated a more traditional “two-dimensional” qubit (2D qubit) device and implemented a two-qubit logic operation – a controlled-NOT (CNOT) operation, which is a fundamental building block of a larger quantum computing system. Their operation showed a 95 percent success rate, enabled in part due to the long coherence time of nearly 10 microseconds. These numbers are on the cusp of effective error correction schemes and greatly facilitate future multi-qubit experiments. A picture of the Silicon chip housing a total of three qubits. 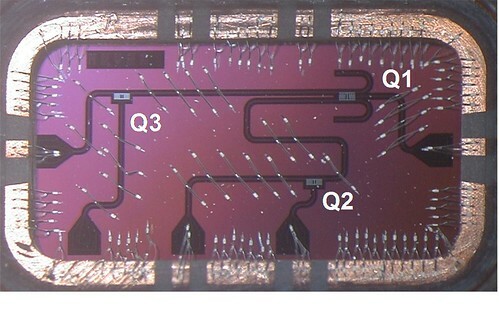 The chip is back-mounted on a PC board and connects to I/O coaxial lines via wire bonds (scale: 8mm x 4mm). A larger assembly of such qubits and resonators are envisioned to be used for a scalable architecture. “The superconducting qubit research led by the IBM team has been progressing in a very focused way on the road to a reliable, scalable quantum computer. The device performance that they have now reported brings them nearly to the tipping point; we can now see the building blocks that will be used to prove that error correction can be effective, and that reliable logical qubits can be realized,” observes David DiVincenzo, professor at the Institute of Quantum Information, Aachen University and Forschungszentrum Juelich. IBM envisions a practical quantum computing system as including a classical system intimately connected to the quantum computing hardware. Expertise in communications and packaging technology will be essential at and beyond the level presently practiced in the development of today’s most sophisticated digital computers. In this latest progress in device performance for quantum computing IBM acknowledges support from IARPA through the Army Research Office contract W911NF-10-1-0324.